One of the fastest and easiest tweaks you can make to improve your photos is brightness and contrast. 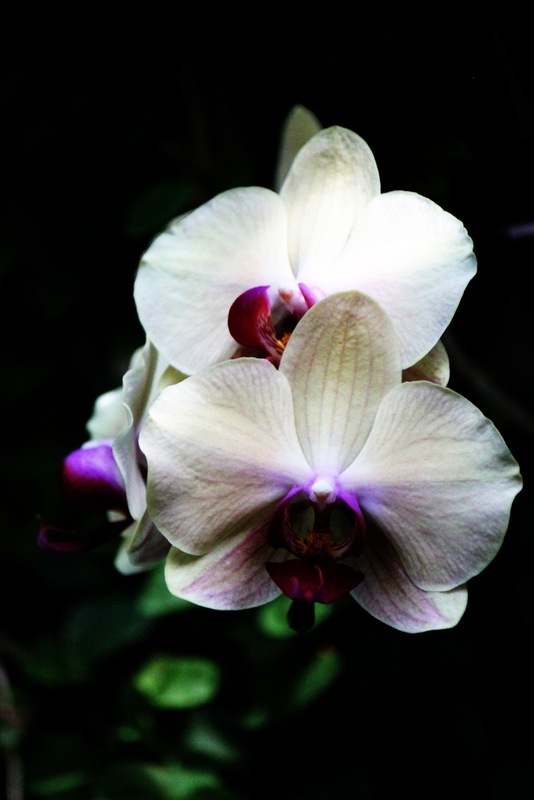 I haven't quite mastered exposure with my digital camera yet, so many of the photos I have taken are either too bright or too dark, resulting in my subject looking washed out or dim. Again, Gimp to the rescue! Let's use the original photo I took of the sign at the Loveless Cafe in Nashville as an example. See how the color of the sign (which is brilliant blue, in person) doesn't really pop? 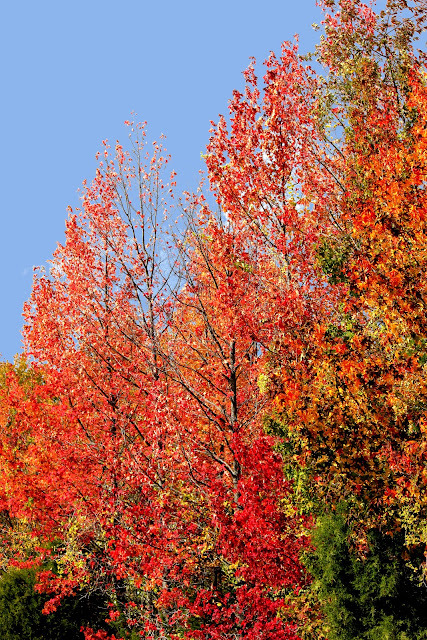 And how the trees look muted in the background, despite their gorgeous fall hues? 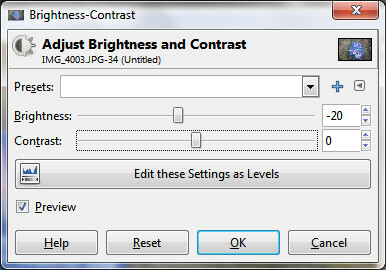 type a number (or negative number) in the number box for Brightness and/or Contrast. I find that dragging the slider is easiest to get in the range I want, and then using the up and down arrows to make slight adjustments works great. Try it out and see what works best for you. 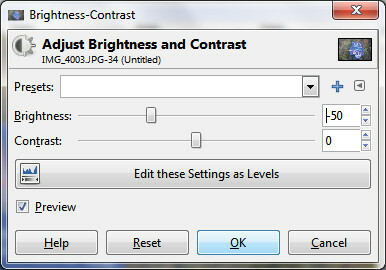 I'm going to start with decreasing brightness, since my photo is overexposed. 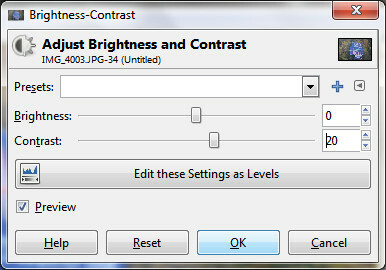 Once I'm satisfied with the brightness level (which I can see in my original photo because the Preview box is checked), I click the OK button. 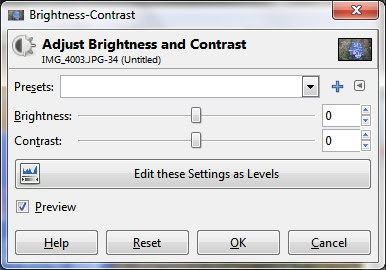 It's hard to see much difference between the original and this one, but it will make a huge difference when you begin to adjust contrast! Much better, don't you think? Love that the blue now looks much more like it looked when I was standing there. And the red of the tree to the right of the sign... yes, that's what I wanted. Play with it a little, or a lot, until you like what you have. And remember that the Undo feature (menu options Edit and Undo) is your friend. Leave a comment if you're having trouble and I'll do my best to help out. 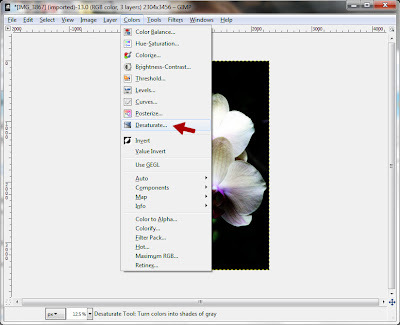 You can also leave a comment if you're just loving what you're learning to do with Gimp or you just want to say hi. Hi! 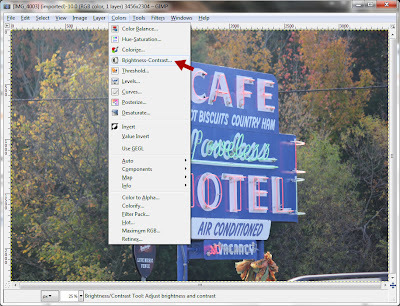 Next time we'll talk about another way to adjust brightness and contrast without using the brightness and contrast tool -- layers! I don't have as many issues with red-eye as I once did. But I have a ton of old pictures that would be so darned cute if not for those blazing red eyes. My little sweeties end up looking like little devils! My sweet husband LOVES to do face painting, only in the non-traditional way. So, many moons ago, he did it up right. 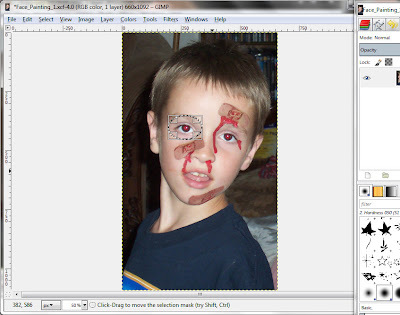 Eli, our youngest (who, to be fair, does get picked on sometimes), looked like he'd just weathered a pretty good fight--probably at the hands of Brandon, his slightly older brother, who had a fantastic bandit's mask and the fists to prove it. This would have been a totally scrapworthy picture... except that Eli looks like Linda Blair has taken him over. What to do? 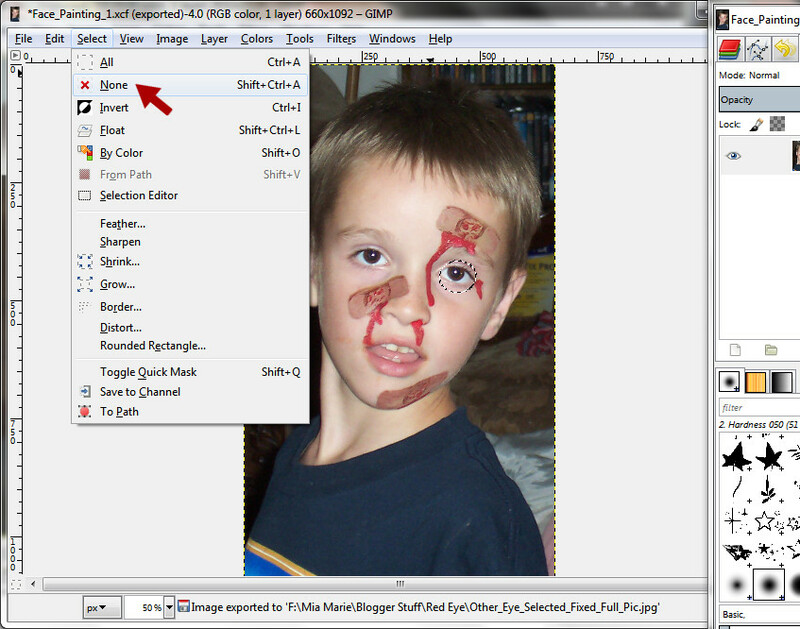 Gimp to the rescue! And it's simple! Did I already mention that? Did I also already reiterate that it's FREE? MOST excellent! First, the Red Eye Removal tool fixes the color red. Not just eyes. 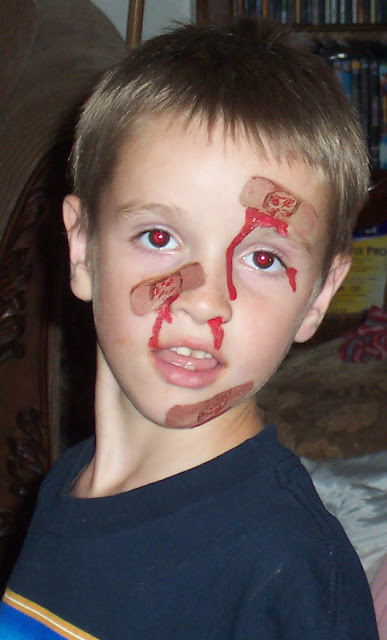 In this picture, there's a ton of fake blood going on (because moderation is not a word that my sweet hubster uses very often), out of the poor kid's eyes, and nose, and out from under (and over) his bandages. 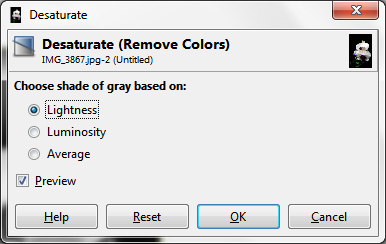 I don't want to change the color of that stuff because, you know, blood is supposed to be red. 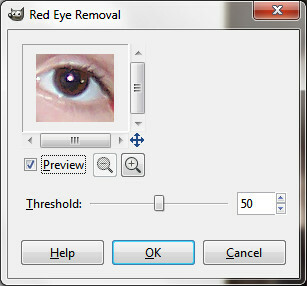 But you can see in the Red Eye Removal dialog preview that all of the blood would be brown if I clicked the OK button. Second, there is a threshold slide that you can move. 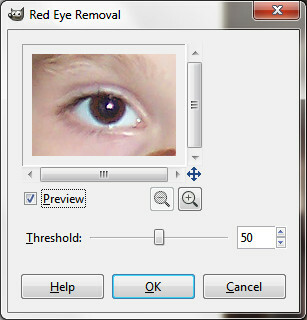 In some cases, the Red Eye removal tool may not be picking up the eyes and manipulating the threshold can give it a boost. 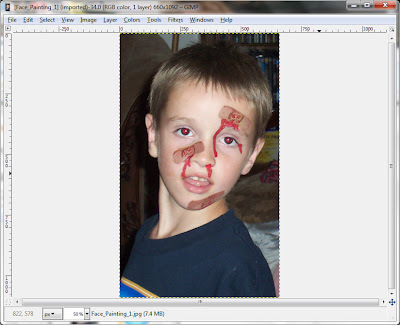 In this case, the red of the blood and the red in his eyes are pretty close, so that won't really help me. Finally, there's our little friend, Wilber. And just to the right is his tip for us. "Manually selecting the eyes may improve the results." 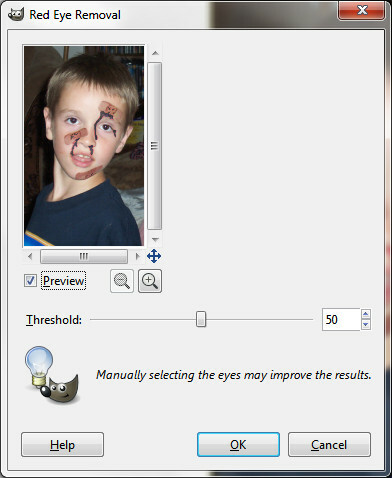 So I click the Cancel button to close the Red Eye Removal dialog and return to the main Gimp workspace, where I can manually select the eyes, just like Wilber told me to. Yay! No blood involved this time, just his cute little eyeball (I know, I'm so cheesy... but I really DO think even his eyeballs are cute! ), and it's a lovely shade of brown (which is good since his eyes are, in fact, brown). 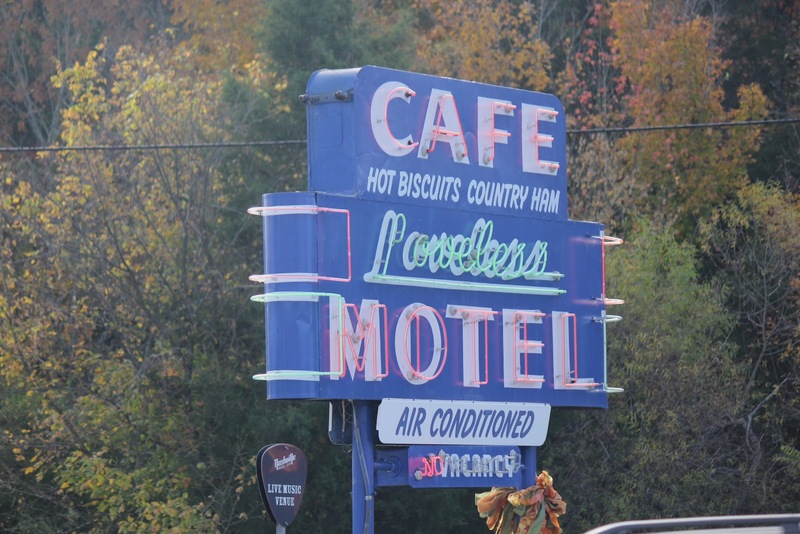 So much better than the whole Linda Blair thing. Just lovely! Note that I tried really hard here to only get his eye and not the blood just to the right. 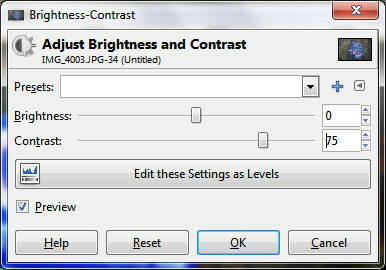 I could have made a smaller ellipse, selecting just the iris area, if I had been really concerned about it. 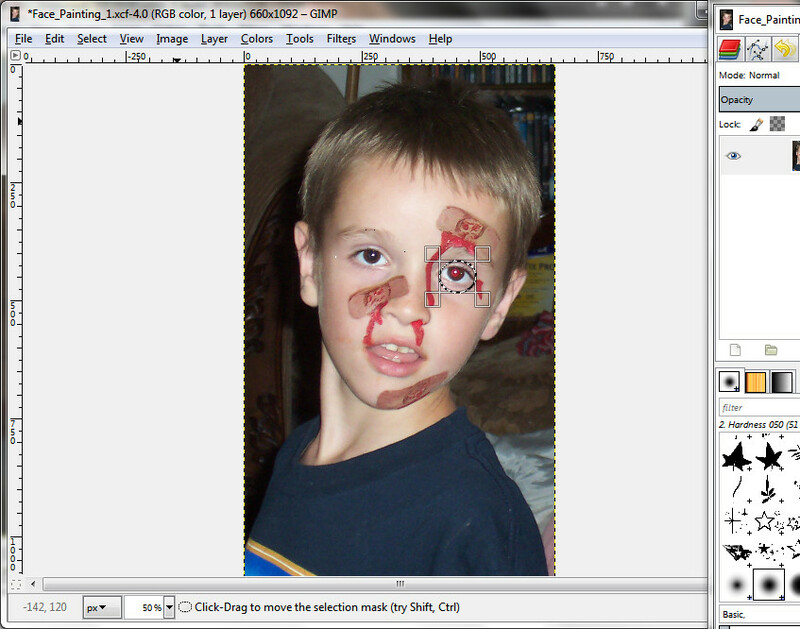 I click OK and see my cute kiddo, in all of his gory glory--red where it should be, brown where it should be. In the Export dialog, in the text box to the right of "Name:" I enter the name of my file. I call mine Face_Painting_2006.jpg (you can name yours whatever you'd like--Superhero_2007.jpg or Camping_2008.jpg or High_School_Graduation_Blackmail_Photo_2004.jpg or whatever). 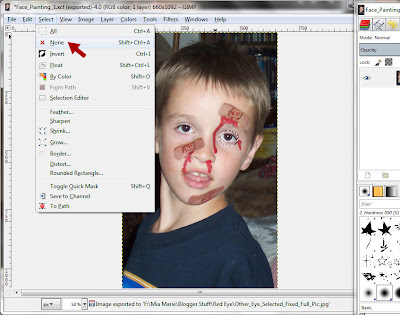 Make sure to add the extension .jpg to the end so it saves as a digital picture file. 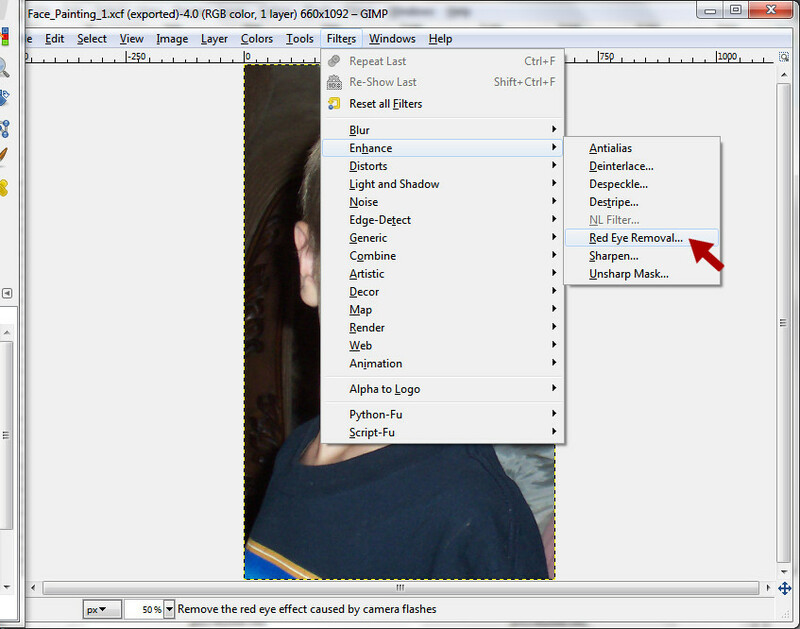 Then I select the folder where I want to store it (to the right of "Save in folder:") and click the Export button. Is that easy or WHAT?!? !